Inspired by the hit PC title and built on the game engine behind the critically acclaimed Age of Empires: Age of Kings, Age of Empires: Mythologies will be the ultimate portable tactical strategy game with its refined gameplay, inspired design, fantastic multiplayer, and extensive replay value. 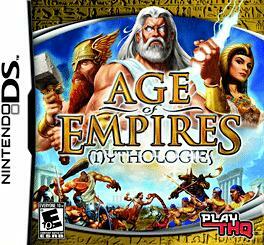 Age of Empires: Mythologies for the Nintendo DS is a compelling new turn-based strategy game that challenges players to shape the destiny of three unique cultures in a fantasy world filled with mighty heroes, legendary monsters, and powerful gods. Players will lead their Egyptian, Greek, and Norse heroes to victory by raising massive armies, waging war, exploring new frontiers, and advancing through three distinct ages that offer fantastic new units, abilities, and god powers like lighting storms, earthquakes, and devastating plagues that players can call on to smite their enemies.